The Pari Center for New Learning was conceived as a haven of peace and gentle action in a world increasingly gripped by turmoil. In adopting Carlo Levi’s maxim that ‘the future has an ancient heart’ we look to the future while bearing in mind the wisdom of the past. Beginning in Andalusian Spain in the 12th and 13th centuries, Europe saw a New Learning emerge as Jewish, Christian and Islamic scholars worked side by side, inspired by a vision of erudition, awareness, and a harmonious society. It was out of these seeds that the Renaissance was born. We believe that a similar transformation is possible today. Our society is undergoing enormous and rapid changes. We are still assimilating the implications of ideas, discoveries and technologies developed in the twentieth century. New technologies revolutionize the way we work and communicate. The human genome project asks what it means to be human. In such a world we need a place in which to pause and reflect on our personal lives, as well as on values, meaning, the directions of society, and the possibilities the future might hold. Where better than the hilltop village of Pari in a community that stretches back a thousand years? ways sowed the seed that grew into the Pari Center for New Learning. 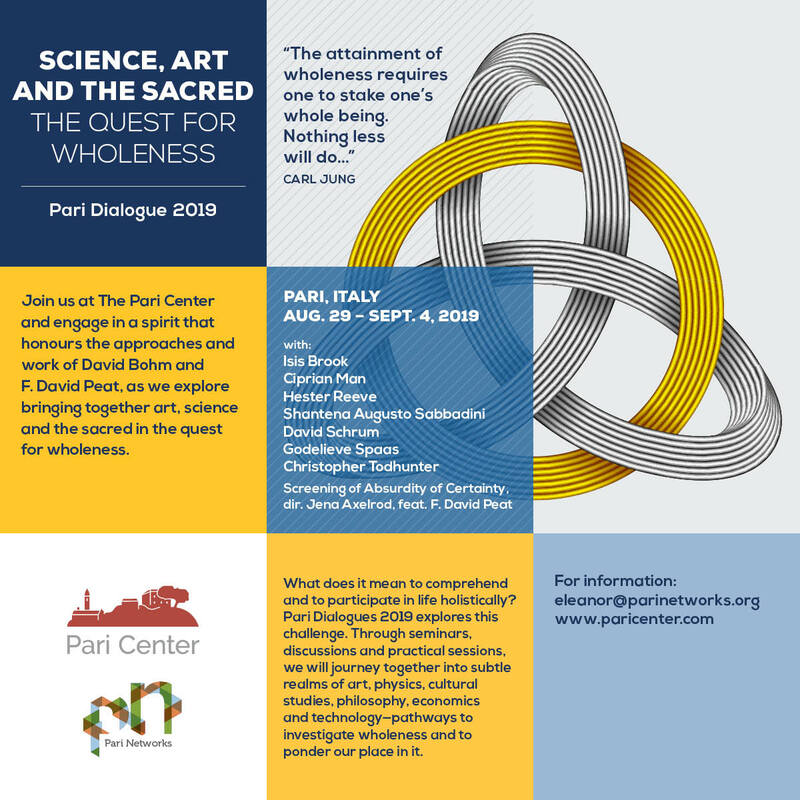 Pari Centre chosen for a three-year Local Initiatives Award from the Metanexus Institute and Templeton Foundation to encourage dialogues between science and religion. 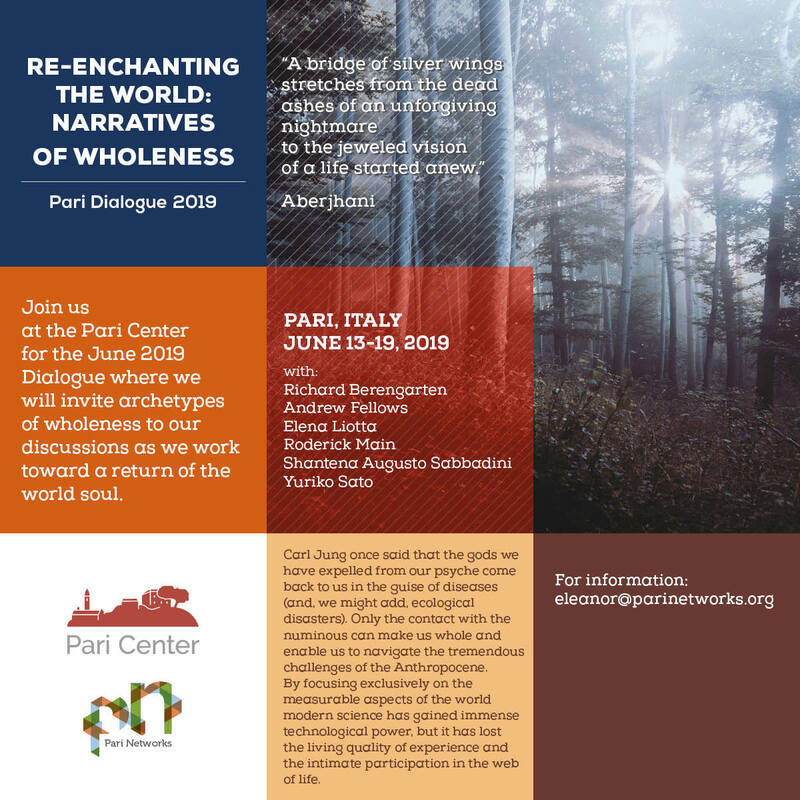 The Pari Center is chosen by Renaissance Europe as Italy’s first ‘laboratory’ to study the way the village will move into the future while preserving its traditions. The first five books of Prof. Roy McWeeney&#39;s WorkBooks in Science and Mathematics became available on the Pari Center Website to be downloaded without charge. Professor McWeeney’s idea is to provide badly needed educational material for those living in developing countries. understanding of organizational dynamics and the dynamics of change. areas such as environmental impact. shape, nature, culture, and how they enable or evoke transitions of people, groups and organizations. Workshop looking at art as a way to understand how organizations become organizing, being becomes becoming, construction becomes constructing. Pari Dialogue 2017. David Bohm Centennial Celebration. Pari is located 38km south of Siena and is built on a hilltop surrounded by olive groves, vineyards and the heavily wooded countryside of the Maremma region of Tuscany. The village remains in a remarkable state of preservation and the surrounding landscape is home to wild boar, deer, pheasant and numerous species of plants, animals and birds. The land around Pari has been occupied since prehistoric times. Later, the Etruscans and later the Romans, made use of the curative properties of the sulfur hot springs, located below the village. Recent excavations close to Pari have unearthed Etruscan burial chambers and artefacts and the remains of a major Etruscan town can be visited at Roselle some 35km away.